America Builders: These three craftsmen are doing the work of Union Pacific, "Building America." They are conductor Bob Alba, brakeman Jeff Duris, and engineer Mark Ledvina, the regular crew on the LPA55, more informally (and popularly) known as the Marsh Job. Their workday started at Milwaukee's Butler Yard at 0530 this morning. Their careers started decades ago. Between them, they have clocked a century of railroad service. After a couple hours building their train at Butler, LPA55 hit the road with two units and nearly 40 cars. First stop: Mitchell Yard, where a car for CP interchange was set out; another hour was spent pre-blocking cars for the industries at the Port of Milwaukee. And then off to St. Francis, where '55 exited the Milwaukee Subdivision for the National Avenue Spur. 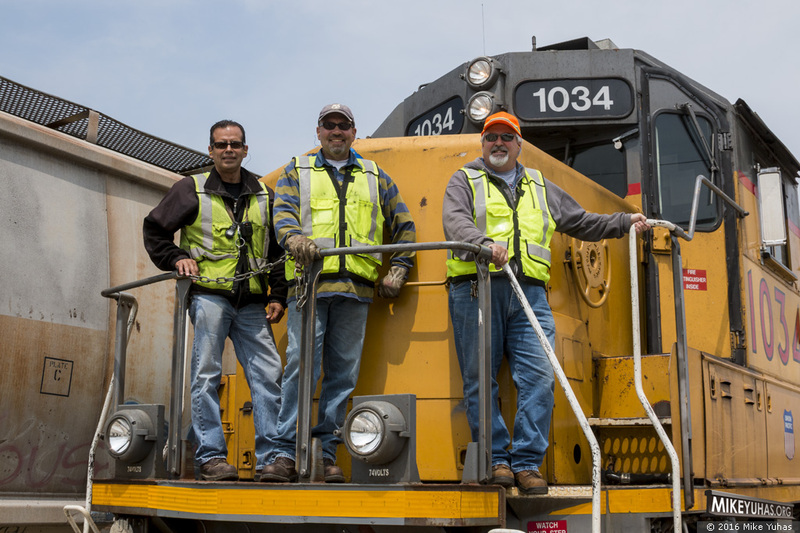 These three dedicated railroaders take pride in doing their jobs safely and efficiently. They are representative of an entire industry, a unique culture, a brotherhood. They are driven to handle their customers' needs promptly and professionally, because they know the only thing they are selling is reliable service. They are in perpetual motion, lining switches, protecting shoves, spotting cars, picking up cars, job briefing with customers, job briefing with the harbormaster, job briefing with each other, tying on hand brakes, moving that cut of cars another foot so the lead car is precisely under the loader, coming back an hour later for the important last load. Building America.